Born in 1979 in Shadhora, India. He obtained his MFA (painting) in 2003 and his BFA (painting) in 2001 from Govt. Institute of Fine Arts, Indore. Kachangal is the recepient of the Raza Award from MP Kala Parishad, Bhopal, 2001; Bronze Medal from Avantika, Gwalior and the Meera Gupta Merit Scholarship, Indore for 2003. Solo shows include Dhoomimal Art Centre, New Delhi, 2005; Birla Academy of Art & Culture, Kolkata; Citibank, Mumbai, 2004 and Central Museum, Indore, 2002 among others. 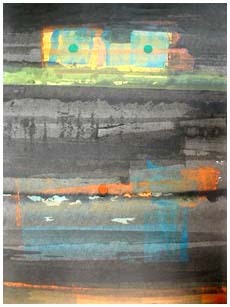 He has participated in many group shows, some of which are “Summer Show”, CIMA Gallery, Kolkata, 2005; Lalit Kala Academy, New Delhi, 2004 and Galerie Muller & Plate, Munchen, Germany Contemporary Indian Painting Exhibition, Kunststation Kleinsassen Art Gallery, Fulda, Germany and the Raza Award Exhibition Bharat Bhawan, Bhopal, 2001 among others. 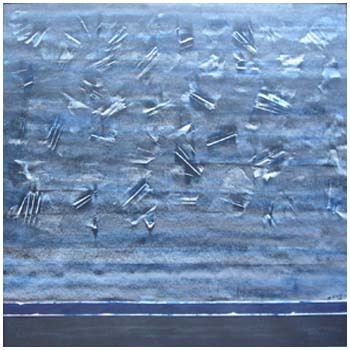 His works are in collections of GIFA, Indore, AIFACS, Delhi, Birla Academy of Art and Culture, Kolkata, private collections in USA, Germany, France & Nepal, Raza Foundation, Mumbai and in the collections of art critics Prayag Shukla and Ratnottama Sengupta, among others. Kachangal lives and works in Indore, India. 2000 Young Artist painting Camp by MPKP Bhopal & NCZCC, Allahabad, at Kanha National Park (MP). 2001 Drawing Camp Organised by Fankar Art Gallery, Indore. 2002 All India Young Artist Painting Camp Organised by AIFACS, Delhi. 1998 Lal Bag Indore ( by Hintal Group, Indore ). 1998 Kala Mela N.C.Z.C.C Allahabad. 2000 Central Musium Indore . 2001 M.G. Art Gallery By N.C.Z.C.C, Allahabad. 2001 Fankar Art Gallery Indore. 2001 A.B.C. Art Gallery, Varanasi. 1997,98 Shree Ganesh Exhibition, Hintal at Devlalikar Art Gallery, Indore. 1998 Kala Mela by NCZCC, Allahabad. 1999 Avantika 7th All India Art exhibition, Gwalior. 1999-03 Annual Exhibition Gifa Indore. 1999 Astagh Sootradhar Exhibition at Devlalikar Art Gallery, Indore. 2000 Raza Award Exhibition Kala Parishad Art Gallery, Bhopal. 2000 Vakanakar State Exhibition, Ujjain. 2000 Annual Exhibition Gifa Indore. 2000 State Exhibition at Devlalikar Art Gallery, Indore by KP Bhopal. 2000 A.I.F.A.C.S. State Exhibition Kala Parishad Art Gallery, Bhopal. 2000 Fankar Art Gallery Exhibition Indore. 2000 Inter College ( Fine Arts) State Exhibition Jabalpur. 2001 Fankar Art Gallery Exhibition Indore. 2001 Annual Exhibition Gifa Indore. 2001 Raza Award Exhibition Bharat Bhawan, Bhopal. 2001 Contemporary Indian painting Exhibition, Kleinsassen Art Gallery, Fluda Germany. 2001 Lt. Mr Ravi Jain Memorial Exhibition, Dhoomimal Art Gallery, New Delhi. 2001 Young Artists Painting Camp Exhibition, Kala Parishad Art Gallery, Bhopal. 2002 A.I.F.A.C.S. State Exhibition KPAG, Bhopal. 2002 Galerie Muller & Plate, Munchen, Germany . 2002 Young Artist Painting Camp Exhibition M.G. Art Gallery by NCZCC, Allahabad. 2002 'Abstract Intones' at M.E.C. Art Gallery, New Delhi.